I have been reading and listening to parenting advice for years and it has not helped. How is this program different? Parent Effectiveness Training (PET) is a life changing program that avoids the trap offering advice and tips. Every problem has it’s own subtle differences and cannot be fixed by generic advice. P.E.T. is based on sound researched and tested psychological principles and offers both theory and the practice of interpersonal skills. The result is a real set of skills to apply to any parenting challenge at any age of your child. How does P.E.T. compare to other parenting courses? Click here for our timetable of upcoming Parenting Courses, Instructor Training and Personal Empowerment Courses. Do both parents need to undertake training for success? Obviously it is great if both parents do the course and learn the parenting skills. Understandably not everyone can make time in their schedule. Don’t stress, often the other parent picks up these new ways of dealing with family problems and positive changes occur in the dynamics automatically. What is available to help me after I have done the program? This is a great question. The P.E.T. Workbook and P.E.T. Text you get during training are both great resources. Some instructors offer ongoing coaching and counselling and some even offer in-house visits to support parents. Some parents like to come to the program a second time when their children are a little older as a refresher. Parents find they gain much from revisiting the program and refreshing their parenting skills. There are no courses that I can attend – what do I do? We offer parenting programs across Melbourne and some regional centres in Victoria. You could organise a group of friends or parents from your child’s school/ kinder/ playgroup etc. and an instructor can come to you. Most instructors will be happy to accommodate your group’s needs. How do I become a PET instructor? Step 1 – Have first hand knowledge or experience of either P.E.T. or Personal Empowerment Program. Step 2 – Successfully complete a Instructor Training (delivered as both a workshop or 1:1 training). Step 3 – Teach a qualifying program to become Accredited. For what ages of children is your program recommended? The P.E.T. program works when parenting children of all ages. Naturally, special considerations have to be made for pre-verbal children. The program and the P.E.T. text and workbook cover methods for listening to children too young to talk, and ways of communicating your needs to children too young to understand words. 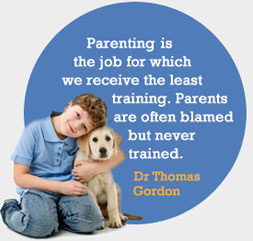 The sooner parents implement the Gordon Model with their children, the easier it gets to use it as children develop. Some parents even come to P.E.T. before they have children. Is this another permissive approach? Definitely not. When parents let children do whatever they want (and as a result parents don’t get their needs met), children tend to be less responsible, less considerate and less caring of parents’ and others’ needs. Children brought up this way are often disliked by peers and can experience unrewarding, shallow relationships. Worse still, parents suffer and tend to distance themselves from their children. The Gordon Model, by virtue of its effective communication skills, does away with the need to be a controlling, authoritarian parent and because of this it can easily be confused as a permissive approach. The secret of the Gordon Model is that it’s a method for resolving conflicts in a way that both parents and children get their needs considered at all times. The difference between our model and other parenting programs is that when children behave in ways that interfere with parents’ needs, the Gordon Model prescribes the use of I-Messages so parents can influence children to change their behaviour. What is the Gordon model? PET is based on the Gordon Model. The Gordon Model consists of understanding and using all the following interpersonal skills in conjunction with each other — Active Listening, I-Messages, Shifting Gears, Method III Problem Solving and No-Lose Conflict Resolution. The course also looks at Anger and Acceptance. Originally developed by Dr. Thomas Gordon in response to the needs of his clients who were parents struggling with their children’s behaviour. We teach this model, using what we refer to as “The Behaviour Window” which guides parents in what to do. Is the Gordon Model difficult to learn? No. The concepts of the program are simple and common sense. Read Our Parenting Philosophy for an overview. The listening skills (Active Listening) and the confronting skills (I-Messages) take practice, but once you have an experience of how powerful they are in helping children when they have problems and for influencing their behaviour, you’ll be motivated to keep practising. How can I tell if the program will work for me? The Gordon Model has been used with great success by parents of varying ages, education levels, income levels and cultures. That tells us that there really aren’t any reasons why it won’t work with just about anyone. There are two key ingredients that determine whether the program will be successful: 1) that you are willing to try it, and 2) a commitment to learn the skills and implement them. When trying out Active Listening for the first time, most parents are surprised by its simplicity and effectiveness. That in turn motivates them to continue learning the rest of the program. Is the model compatible with religious teachings?